The National Medical Association (NMA) was aware of this hospital. Newark was the site of the organization's annual meeting in 1919 and 1929. An editorial in the Journal of the National Medical Association about the 1919 NMA Annual meeting stated that "the lack of hospital facilities by our own people prevented the usual clinical demonstrations by men of our association" (J Natl Med Assoc. 1919; 11(4):156-157). In contrast, for the 1929 NMA Annual meeting, there were hospital facilities available that were run by African Americans--Wright Sanitarium and Maternity Home and Kenney Memorial Hospital--where men of the NMA held clinical demonstrations. 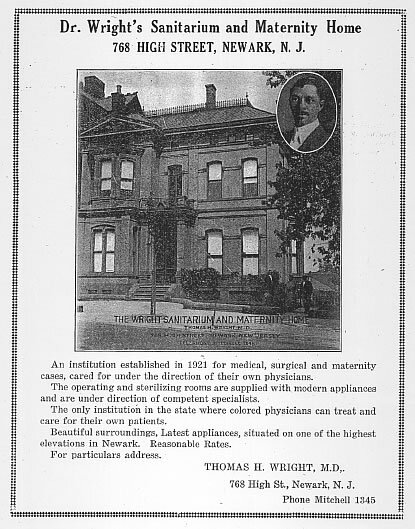 Surgical clinics were held at Wright's sanitarium. Surgical clinics and and physiotherapy demonstrations were held at Kenney Memorial Hospital (J Natl Med Assoc. 1929;26:124-129). An institution established in 1921 for medical, surgical and maternity cases, cared for under the direction of their own physicians. The operating and sterilizing rooms are supplied with modern appliances are under direction of competent specialists. The only institution in the state where colored physicians can treat and care for their own patients. Beautiful surroundings, latest appliances, situated on one of the highest elevations in Newark. Reasonable Rates.